Thank you for participating; 800 ballots were cast. Establishing policies and plans for growth, communications, event guidelines, local governance, etc. On a personal note, I’m humbled by the fact the community placed my nomination and that CfA is dedicated to divesting the Brigade’s leadership power into its community of leaders. I can see we are on the verge of a new social movement that is aligned with social justice, equality, health, and housing. Our skills are a bit geekier, and we have much to learn from our past, but our values are not divergent. Our civic hacking values grow from our collective uprisings for justice and self-determination. As a member of this national community, we will move forward. Pal’ante! Juntos! Forward! Together! 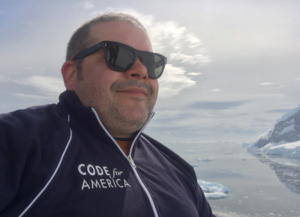 More information to come after the Code for America summit in early November. As reported in Civicist, I am cautiously optimistic. Since BetaNYC’s 2013 reformation and joining the Brigade program, I’ve participated in a struggle to build a national organization that uses our passions to solve local issues and improve ourselves and our neighbor’s lives. In 2013, BetaNYC’s community wrote a roadmap that defined our values. Locally, we have built a social movement where our collective voices are baked into local decisions. At the national level, Brigades have not had the same opportunity at self-determination. This year, CfA addressed this through a co-creation process that has left us with the very important decision that needs to be made TODAY. I am on the ballot and I want civic hackers to have a national organization that will hear their voices and guide them into sustainability. My next step is to help determine our national roadmap. As local and national leaders, our voices should be at the table. To ensure this, Lauren Reneé and I have discussed the following goals. Outline collective governance of the NAC. This includes ensuring members have designated proxies and there is a clear understanding of succession. FYI – Lauren Reneé, BetaNYC’s treasurer, would be my designated proxy. Host a constitutional convention that defines a clear relationship between Brigades and Code for America. Outline a business plan around that constitution. Ensure the NAC and local leaders are given financial and leadership tools to excel. Ensure future NAC leadership is diverse across gender, ethnicity, and geography. Please take a few mins to read what other Brigade leaders are saying — Vyki Englert, Jill Bjers, Luigi Ray-Montanez, Nick Kaufmann, Jason Hibbets — a few informative articles, CfA Welcomes the community to vote, Civicist: recharging the brigade & CfA Brigade to elect first national advisory council and Technica.ly’s post.